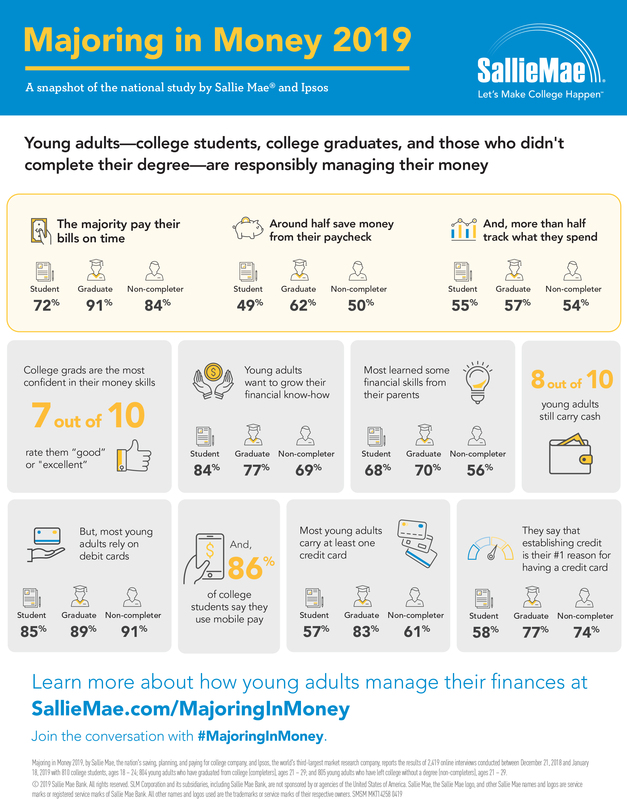 "For the most part, these young adults prove their savviness by making their money resources work for them"
NEWARK, Del.--(BUSINESS WIRE)--Young adults feel confident in their money management skills and demonstrate responsibility by paying bills on time, tracking their spending, and not spending more than they have, according to “Majoring in Money 2019,” the latest report from Sallie Mae and Ipsos. They are also eager to establish credit and expand their financial literacy; when put to the test, results show more education on managing finances would be beneficial. “Majoring in Money 2019” examines the financial skills of three groups: college students, college graduates, and non-completers, those who began their college studies but left school without obtaining a degree. College graduates are the most confident, with 71% rating their money management skills as good or excellent, while 59% of college students rate themselves the same way. Forty-two percent of those who did not complete college rate their skills as good or excellent. The majority of young adults demonstrate fiscal responsibility in a number of ways. Ninety-one percent of college graduates, 84% of non-completers, and 72% of college students pay their bills on time, and more than half of each group say they track their spending and never spend more than they have. Sixty-two percent of college graduates, and half of college students and non-completers are saving money every month. Forty-one percent of college graduates say they have an emergency fund, compared to 22% of college students and 31% of non-completers. When it comes to paying for purchases, debit cards are nearly universal, and are the most frequently used payment method. While 81% of young adults still carry cash, 89% of college graduates and 91% of non-completers and 85% of college students use debit cards. Eighty-eight percent of college graduates, 86% of students and 78% of non-completers use mobile payments, most often citing PayPal and Venmo. Young adults aren’t shying away from credit cards, and the majority have obtained one to establish credit. Eighty-three percent of graduates, 61% of non-completers, and 57% of college students have at least one credit card. Sixty percent of college students, and 64% of college graduates report paying credit card bills in full each month, compared to 32% of non-completers. Virtually all young adults—97%— make at least the minimum payment each month. “Majoring in Money 2019” also identifies a relationship between completing college and financial management success. College graduates are most confident, better understand how money and credit work, know their credit score, and are saving from their earnings. That said, young adults, including college graduates, are interested in further developing their money management skills, and the report highlights the need to do so. When put to the test via a four question, multiple-choice quiz on interest and the cost of credit, only 24% of college graduates, 18% of non-completers, and 10% of students answered all questions correctly. 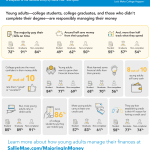 “Majoring in Money 2019” reports the results of 2,419 online interviews with young adults ages 18-29. Ipsos conducted interviews in December 2018 through January 2019 of 810 college students, 804 college graduates, and 805 who attended college but are no longer enrolled and do not have a degree. 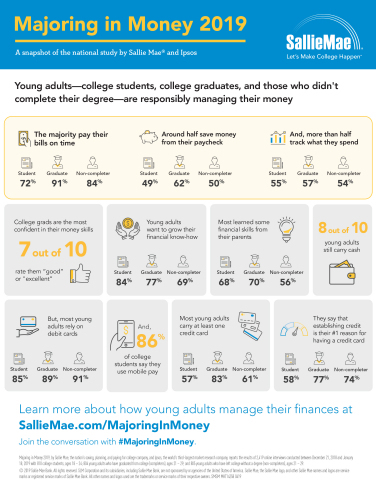 The complete report and a related infographic are available at SallieMae.com/MajoringInMoney. Join the conversation using #MajoringInMoney. Sallie Mae and Wise Bread will co-host a Twitter chat to discuss the report on Thursday, April 18, at 3 p.m. ET. Follow the chat using #MajoringInMoney and #WBChat. For more information, or to start your plan to pay for college, visit SallieMae.com. Ipsos is a global independent market research company ranking third worldwide among research firms. At Ipsos, we are passionately curious about people, markets, brands, and society. We make our changing world easier and faster to navigate and inspire clients to make smarter decisions. We deliver research with security, speed, simplicity, and substance. We believe it’s time to change the game — it’s time for Game Changers! Visit http://www.ipsos-na.com to learn more.